Looking to buy the best accessories to shoot videos while you are riding a bike? Want to know all about some of the best gears professional bikers and vloggers use for biking purposes? 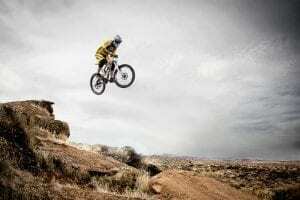 Do you want to make your biking experience more awesome by shooting videos from different angles with the help of best GoPro biking accessories? Don’t worry. Don’t Panic. We have got all the solutions for you as here in this article we are going to cover the 7 best GoPro biking accessories that you should have in order to enjoy perfect biking experience. Biking is a fast and a sport which requires dedication, work, stamina, and passion. Many professional bikers do showcase their skills or stunts or biking experience on their YouTube channels which many people find interesting. They film these shots with the help of GoPro cameras. Now you must be wondering that how can they hold the camera in a pitch-perfect position for taking beautiful shots? The answer is simple. “GoPro Accessories“. Yeah, you cannot take beautiful biking clips or videos without the help of GoPro accessories. Don’t believe us? Try to do biking withholding the GoPro camera in your hand and you will know for yourself. The products we have listed are solely researched on the basis of their performance, function, positioning, and user reviews because we know the amount of trust you people have on us. 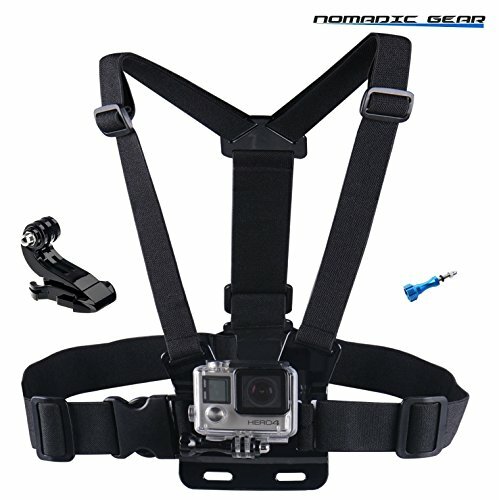 Nomadic gear chest mount tops our list for being the best GoPro biking accessory. It’s, in fact, one of the most important GoPro biking accessories and you should have this accessory in order to take beautiful shots. The chest mount is durable and reliable and it fits almost all chest sizes as well. It is padded so that you can feel comfortable while you drive your bike with concentration. There are a metallic thumbscrew and J-hook available which will let you adjust any GoPro camera. It is compatible with almost all version of GoPro hero cameras and that’s the main reason of its popularity. You can use this chest mount to experience brand new viewing angle as the camera will see all through the handlebars of your cycle. On the other hand, the straps can easily be fitted and adjusted to any adult size. The J-Hook available in this chest mount is curved up so that you can maintain the position of the GoPro camera to look forward. Nomadic Chest Mount is the first choice accessory for any biker and that’s the main reason for them shooting awesome biking clips easily. Go for it, if you need a chest mount for taking wide-angle shots with your GoPro camera. Want to enjoy the front GoPro camera shots with the help of a helmet mount? Don’t worry ProGear Helmet mount is there to get it all done for you. The helmet mount is easily adjustable to any helmet you wear and allows a perfect view angle to the GoPro camera as well. It is compatible with almost all GoPro cameras and you can also mount your camera on side of the helmet with the help of this mount. The helmet mount comes in a bundle and consists of thumbscrews, plastic screws and mount respectively. On the other hand, the best thing about this helmet mount is, it’s been checked by an official GoPro technician so you will have a piece f mind and your camera will be safe and secure while you ride your cycle to showcase your skills. Perfect for all type of helmets. Provides extra security to the camera. Screws become loose after some time. 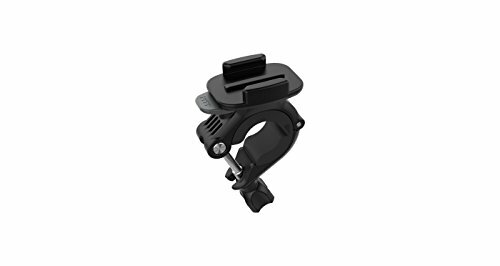 ProGear front helmet mount is an accessory which is worn by many professional bikers to capture stunning and wide angle views while they are on a ride. You can get this mount easily by spending a couple of bucks on it. If you are a biker, you will be well aware of the fact that everyone wants their videos to shake free and blur-free. Unfortunately, this is not possible in biking when you are driving on bumpy roads or rough terrains. For overcoming this problem GoPro has introduced the brand new GoPro karma grip which will let you hold the camera with ease and with a firm grip. The karma grip is used to make your shots shake and blur-free. You can take breathtaking shots with wide angle views with the help of this grip. On the other hand, it has got control buttons which lets you easily adjust the camera according to your needs. 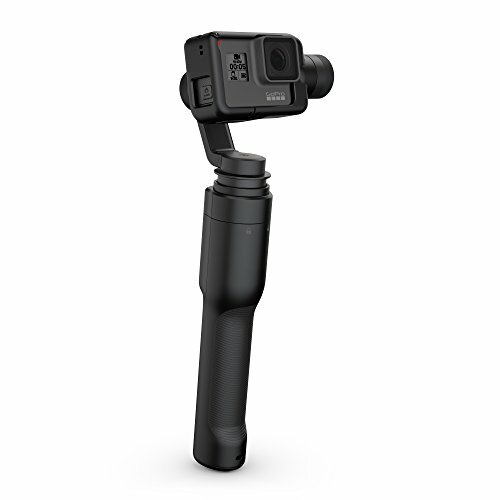 The GoPro karma grip is compatible with Hero 5 black and Hero 6 black respectively. You will have to buy separate harness in order to make it compatible with GoPro hero 4 black and GoPro hero 4 silver session cameras. The price f the GoPro karma grip is high as compared to other accessories but you will need it badly considering the features it provides. Compatible with Hero 5 and Hero 6. GoPro Karma Grip is the best GoPro biking accessory for having a firm grip on the camera and for taking smooth shots without any worries. Buy this grip for making your biking adventure more memorable. A drone adds more beauty to your biking videos by capturing some bold aerial shots. That’s the main reason most of the professional bikers keep a drone so that whenever they go on mountain biking, they can capture the beauty from the top of the earth. The DJI Mavic Air is a drone used or these kinds of purposes. It is able to capture 4K videos at a standard fps rate and can also take pictures of high resolution as it has a 12 MP camera. It has a black color and the design of the drone is pretty sturdy and eye-catch as well. There is a 3-axis gimbal stabilized camera available which keeps the camera steady for taking perfect aerial shots. Moreover, there is GPS navigation and vision position based navigation also available. The drone is able to store video and photo files for up to 8GB. It has got a top speed of 43MPH as well which is quite exceptional and will assist you a lot in taking the perfect shot easily. There is an active track feature available which will let the drone track you or your bike from the top view easily. Allows you to capture stunning scenery. 4K video and 12MP photo quality. DJI updates are not worthy. DJI Mavic Air is the drone that almost every biker should have if he wants to take shots from an aerial view. 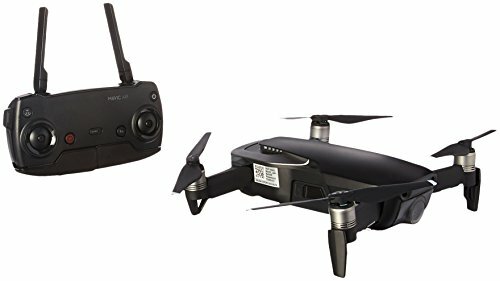 Aerial view shots add more awesomeness in videos and this drone is able to shoot a 4K video from the top view as well so you must go for it and add it in your GoPro biking gear. Capturing shots from a handlebar point of view is necessary for bikers as it has a great impact on the video and makes the video more cool and awesome. For this purpose, GoPro Handlebar Mount is there to get it all covered for you. This handlebar mount can easily be mounted to almost any diameter of the handle and allows a firm position to capture different shots easily. It has got 360° rotation feature which allows you to capture shots from different angles easily. Moreover, the design is sturdy and it is durable as well. Your camera is safe when you mount it on this handlebar mount. The durable construction of the handlebar mount keeps it away from slipping and breaking and is able to minimize the vibration as well. Adjusts all type of handlebars. Great for all GoPro cams. No specific cons to discuss. GoPro Handlebar mount is a necessary GoPro biking mount that you must buy in order to take breathtaking shots from the handlebar point of view of your cycle. keeping extra batteries is a good idea when it comes to biking because there should be backup power source available in case your GoPro camera battery dies out in the middle of the shoot. 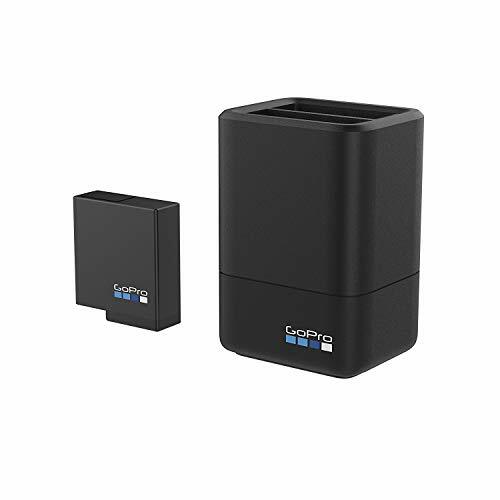 For this purpose, GoPro dual battery charger + battery is introduced which can overcome your charging issues. This charger is able to charge two GoPro hero 5 or hero 5 batteries at the same time. There is a USB port available for USB charging and for a fast charge sue International Supercharger by GoPro to recharge the batteries quickly. Moreover, there is a spare 1220 maH lithium-ion rechargeable battery available as a backup to power your GoPro camera quickly. Includes charger and spare battery. Good Backup for power issues. batteries can be charged quickly. You must keep spare batteries and a quick charger to keep your GoPro camera away from power issues and problems and this accessory are the best one for this purpose. 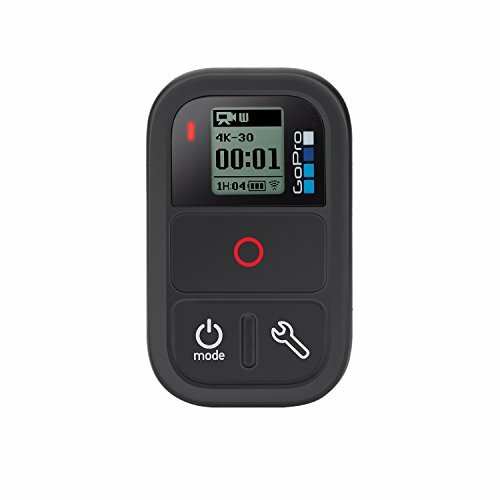 GoPro smart remote is used for managing and operating the GoPro camera with ease and convenience. The smart remote can be connected to GoPro camera with an optimal range of 660 feet which is quite exceptional. Moreover, you can access all the options of your GoPro camera with just a click of a button on the smart remote. You can easily adjust this smart remote on to your bike handlebar and can manage the position of your camera even if you are driving. The smart remote has the ability to control almost 50 cameras and it has got an LCD panel as well. The optimal range is 660ft. You can use it to access all options easily. GoPro Smart remote is an important GoPro biking accessory which is used to access different options of a camera from a far distant place. If you are a professional biker, must add this remote to your GoPro biking gear for more perfect shots. We have listed some of the best and must have accessories for you and now it’s your choice to add them to your fear. These accessories will only provide more beauty and convenience to you GoPro videos while you are biking on rough terrains. They are used to add more perfection in the videos you make. 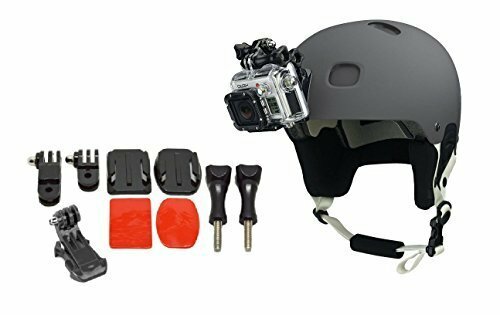 try to buy them all to complete your GoPro biking gear and start shooting biking videos like a pro.